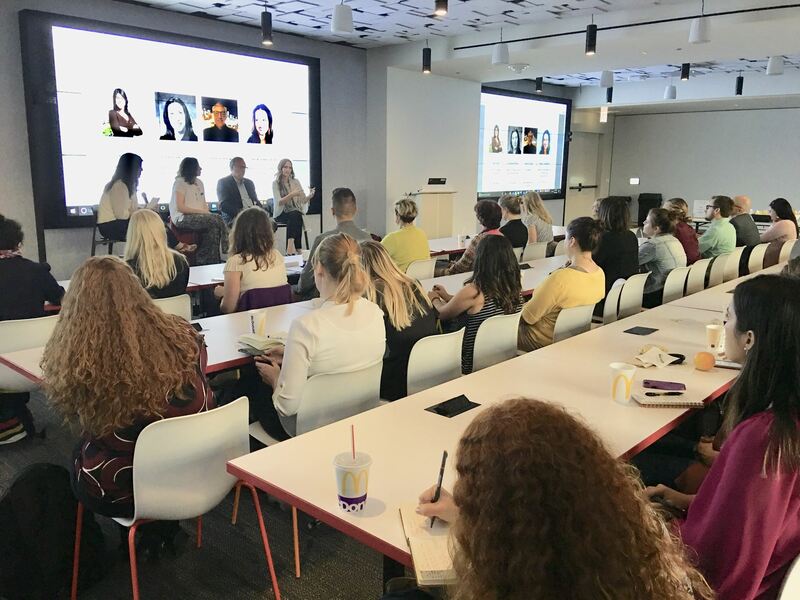 Last Tuesday (10/9/18), nearly 50 people from diverse professional backgrounds attended Net Impact Chicago’s “Careers with Impact” - a panel discussion around how one can achieve “impact” in a career whether it is in a traditional Corporate Social Responsibility (CSR) role, or working for a company that has little or no initial formal commitment to sustainability. Attendees got to learn from experienced and committed panelists via listening to an expertly moderated panel discussion, asking direct questions of the speakers, and chatting afterwards over snacks and drinks. Jessica Rivas first shared her journey transitioning from her career as an attorney to a career in social impact. She explained how she knew she wanted to be in a career that related to social impact, although after many years as a real estate attorney, she wasn’t sure what that transition looked like. Rivas shared and provided a framework for how she made her career transition. The first step was identifying her own passion/ causes, recognizing her strengths, specializing in the subject matter one cares about, filling in key gaps via education, work experience, or volunteering, and putting her learnings into action. She shared with attendees that these same steps can be used by anyone to transition into a career in social impact or any career of interest. Currently McDonald’s is leveraging its large consumer presence into a “Scale for Good” initiative to influence positive action both within their business network and beyond it. Next, David Doig shared his experience about how his meaningful volunteer opportunity in the Lawndale neighborhood of Chicago during college as a young man shaped his career. From his past experience, he received a role in government where he had an opportunity to work on high responsibility projects at a young age, which gave him the experience to be successful in multiple jobs and lead to where he is today. Doig emphasized that he measured his impact and success based off of the quantifiable outcomes in his work. Example outcomes he shared with us was metric-specific like tracking decreasing the percentage of crime in a neighborhood he worked in and tracking the percentage of poverty. These positive outcomes do not happen in a vacuum, but rather deally build on existing community assets like motivated workforces, transport infrastructure, and cross-sector partnerships. For instance, Chicago Neighborhood Initiatives helped bring the innovative Method soap factory,Gotham Greens rooftop farm, and related renewable energy facilities, adding new “green jobs” to the historic district originally made famous by the industrial age Pullman factory. In conclusion, the panelists agreed that they started their road to success by engaging with groups like Net Impact Chicago. One of the attendees, Rachelle Jervis, President & CEO, Executive Service Corps of Chicago, shared her thoughts after the panel. Rachelle stated, “Net Impact’s panel highlighted the importance of starting where you are. You can be inspired by these panelists to get moving on making a difference in your community.” We are happy that this event was able to have a profound impact on our members and provide a venue for like-minded people to network and figure out ways to collaborate. Please watch our Net Impact Chicago Events page for more details and RSVP links which will be posted soon. We hope to see you there!